Fives' challenge was to supply a high pressure LNG pumping system dedicated to 2 stroke marine engines in order to use natural gas as fuel. Due to the heavy constraints of the marine industry, Fives suggested the Cryomec -THOR pump range to provide ultimate reliability and robustness. 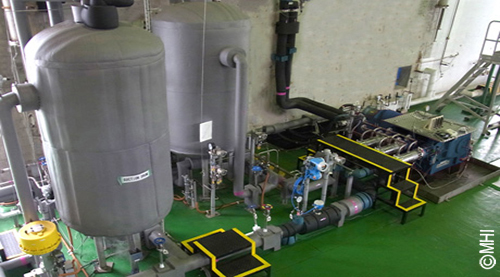 Backed by a series of successful bench tests performed by MHI since 2011, the first high pressure Fuel Gas Supply System was implemented and tested by a gas engine manufacturer in Japan (Tamano, Okayama), in 2013 - A world first! Both from an environmental and a technological perspective. Today, the Gas Fuel System for a gas injection engine for onboard equipment is already at its marketing stage and ready to be delivered by MHI. To seal 6 years of steady cooperation and prepare for a promising future, MHI and Fives agreed on an exclusive agreement in February 2014.